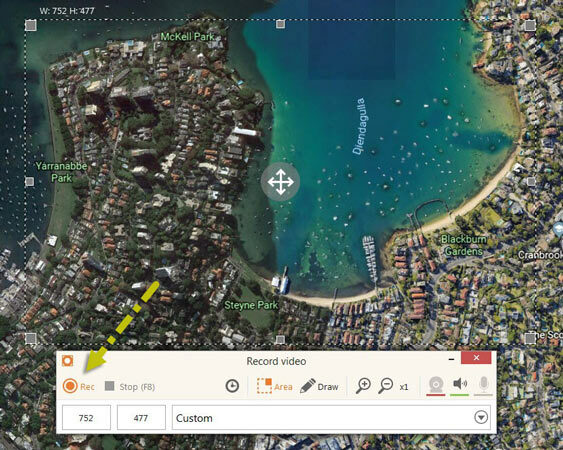 Record Google Earth to Make That Satellite Views Stay! Providing a 3D representation of our mother earth based upon the satellite image, Google Earth is no doubt a powerful and magical existence for letting us know more about the world in different perspectives. And it would be more excited if we could record this whole world tour which Google Earth takes us on. Below are the two perfect methods for you to record Google Earth. As an intelligent online screen recording tool, being able to capture both screen and sound is its specialty. And it comes along with an annotation tool which enables you to show “painting skills” on the screen during the recording. 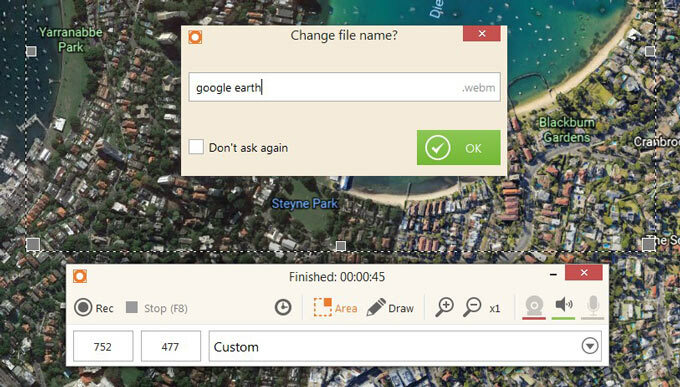 Most importantly, you can use it to capture Google Earth without time limitation. Go to the main site of this free online screen recorder. You will need to download and install an online launcher if it’s your first time using this recorder. Once done, click “Start Recording”. 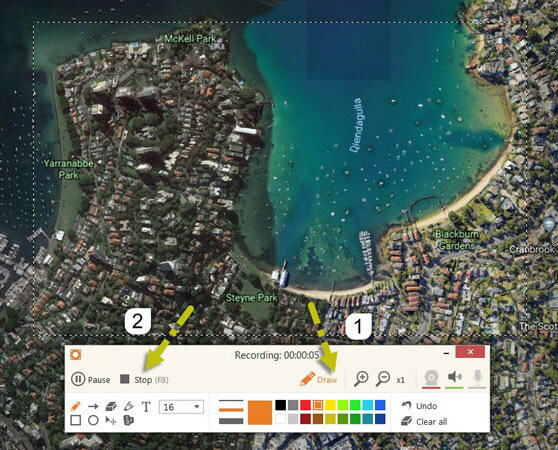 Open Google Earth and drag the recording area to the size which just fits the region you want to capture. 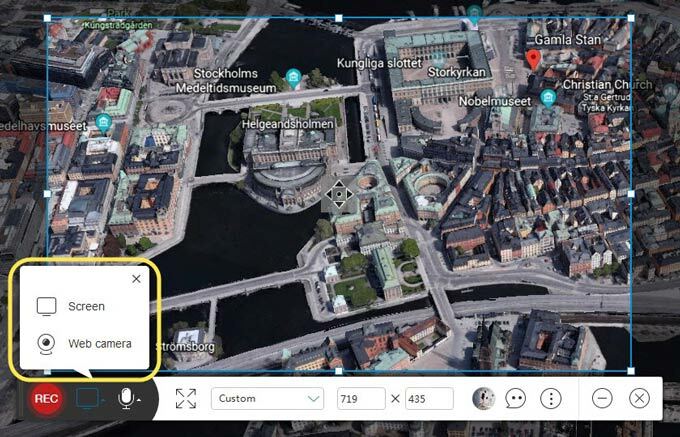 Then, you can click the red REC button to start recording Google Earth. Of course, you can also click the computer-liked icon to decide whether you want to include webcam or the screen only. In the course of recording, annotation panel can be expanded by hitting the pencil-liked icon. And click the first red button to stop the capture. 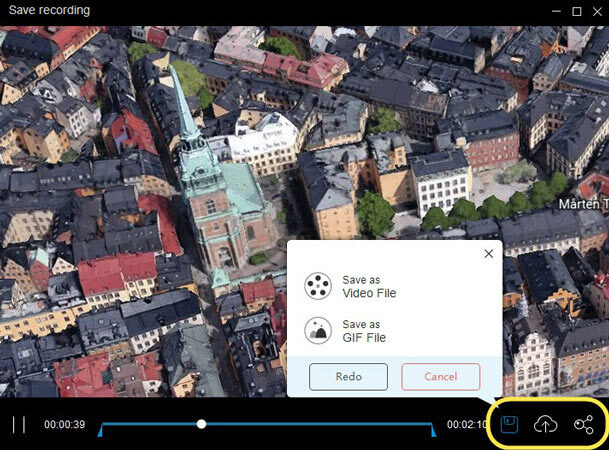 Now, you will be led to the page of recording view, here, you can save the recorded file as a video or a GIF. 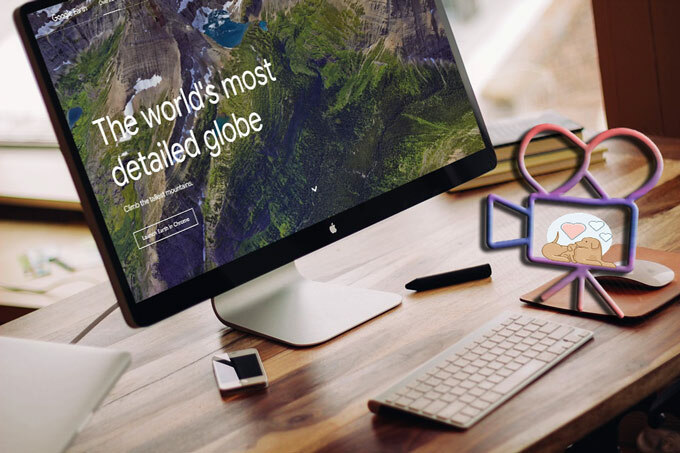 Ans it’s optional to upload it to its cloud platform – ShowMore, from where you can save and share your videos. 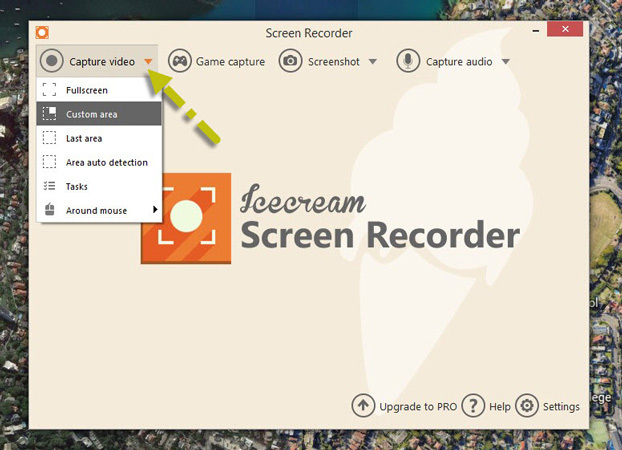 Download and install Icecream Screen Recorder. 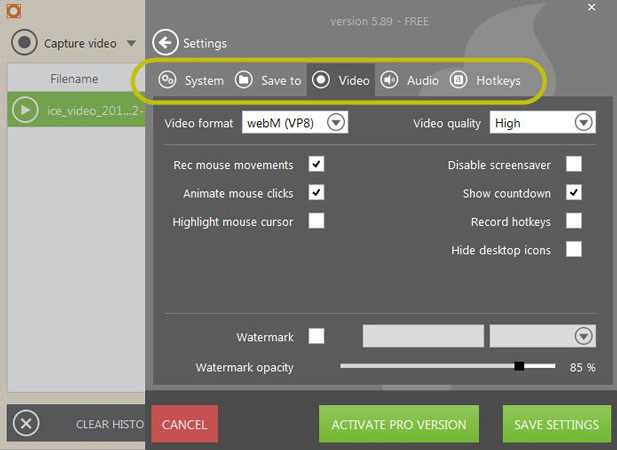 Open the program and enter “Capture video” to use full screen or customized recording area. Next, start the recording by clicking “Rec”. You can also click “Draw” from the toolbar to further do some editing work on the recorded screen. And once finished with this “Google Earth recorder”, you can click “Stop” to wrap up. A window will then pop up for you to edit the file name. Just enter the name you like and choose “OK” is alright. Lastly, a notice will show up, saying the video is saved successfully. Simply click this notice and you will see the recorded file. 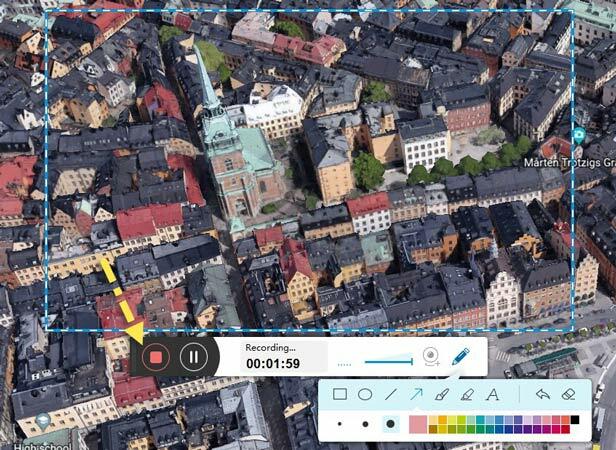 While using the amazing tools above to capture Google Earth, you may have extra recording needs such as bit-rate, frame rate, etc. Well, let’s follow through the steps below to find out the hided settings in those two recorders. For Apowersoft Free Online Screen Recorder : Click the icon pointed out as the picture shown below, then you will see the settings panel. From there, you can adjust recording mode, frame rate, mouse style or audio quality and so much more. For Icecream Screen Recorder: Enter the settings section at the bottom right corner and the settings menu will slide out. Then, you can begin to change the audio or video set up, etc.